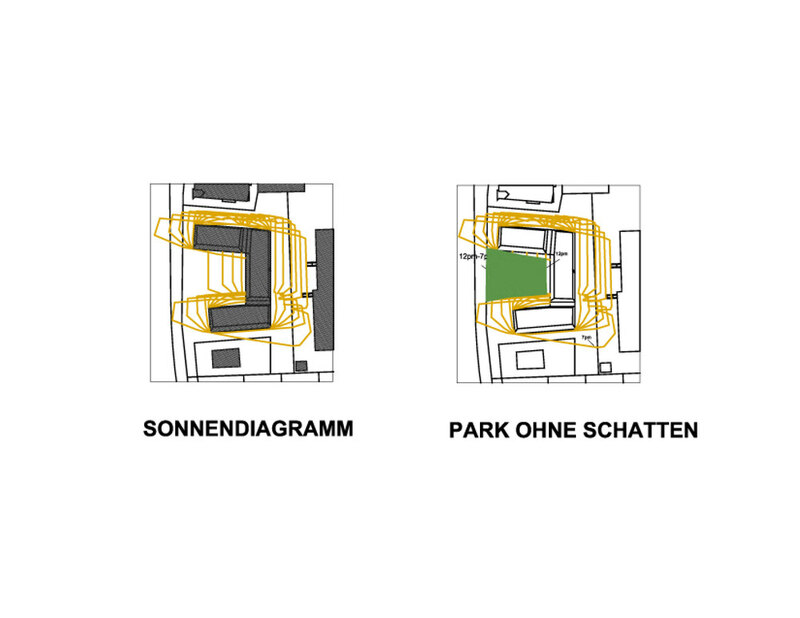 Design: Residential Complex, Wettbewerb Pauernfeindstrasse, Salzurg, Austria. The project makes full use of the set-back limits of the site by determining the best location the footprint, and minimizing shadows on the design itself, and on the surrounding buildings. Orientation becomes the incentive to tilt the faces of the volumes, more towards the south and west, and less towards the north and east. This calibration gives the volumes their characteristic crystalline form, reminiscent of a finely faceted salt crystal. Taking advantage of the pitches in the volumes, the whole complex becomes a seamless Tecu-Brass pitched-roof system. The advantage of all the exterior surface being treated as a roof system is that there is no need for water collection gutters, or snow collecting maintenance, leaving the pitched roofs to repel any moisture, water or snow collection. There would then be a series of gutters which would be located at the ground level in the perimeter of the whole building for easy maintenance. Environmentally as a single exterior surface, there would be no separation between wall and roof, avoiding seam lines, and allowing a constant thick wall thickness throughout.The Gold ochre coloration of roof is made up by anodized aluminum of powder-coated steel sheet, or the Tecu-Brass cladding system. The color scheme of the golden surface produces a warm, light reflection by reflecting light coming out of the wall surfaces. This golden glow introduces a friendly tone in dim days and encourages artificial indirect reflected-lighting during the night. Team: Invited Competition Daniel Lopez-Perez with Erhard An-he Kinzelbach.